Did you know that flaxseed isn't technically a grain? It does have a similar vitamin and mineral profile to grains, though, but it has more fiber, antioxidants, and healthy omega-3 fatty acids. Add that it's low in carbohydrates and you have an ideal food for people who are cutting back on starches and sugars. Preliminary studies on flaxseed, when taking internally, show potential benefits. Now, mostly because of its high content of fatty acids, we know that flaxseed makes a great addition to skin care formulas, as well. Flaxseed contains fatty acids, lignans, and antioxidants. Native to the eastern Mediterranean and India, flax is a member of the genus Linum in the family Linaceae. It was extensively grown in ancient Ethiopia and Egypt, with dyed flax fibers found in a prehistoric cave in the Republic of Georgia dating to 30,000 B.C. The annual plant grows to about three feet tall, with slender, long stems and five-petaled flowers that are pale blue or red. The fruit is a round, dry capsule containing glossy brown seeds. Various parts of the plant were used to make fabric, dye, paper, medicines, fishing nets, and soap, whereas the seeds have long been used to make linseed oil. According to the University of Maryland, flaxseed was used historically primarily as a laxative. It's high in fiber and a gummy material called “mucilage” that expands in water, so it adds bulk to the stool to help move it along the gastrointestinal tract. The Chinese used it for dry skin. Indian Ayurvedic practitioners recommended it for the treatment of heart problems and eye health. Flaxseed is a good source of manganese, vitamin B1, and magnesium, but is a major powerhouse when it comes to omega-3 fatty acids. Some studies have indicated that flaxseeds may lower cholesterol levels, particularly in women, and may benefit individuals with certain types of cancers. In fact, in animal studies, the omega-3 fatty acid found in flaxseed (ALA) inhibited tumor incidence and growth. It also seems to have the ability to stabilize blood sugar levels. Flaxseed is also high in “lignans,” a type of phytoestrogen that has shown some ability to protect against cancers sensitive to hormones. Lignans have also shown in studies to help prevent hardening of the arteries and keep plaque from building up inside them. Omega-3 fatty acids may also play a role in maintaining the heart's natural rhythm, and both ALA and lignans may help decrease inflammatory reactions that can lead to Parkinson's, asthma, heart disease, and strokes. Fatty acids keep skin hydrated, moist, and smooth, preventing drying and reducing the look of fine lines, wrinkles, and dullness. Antioxidants help protect the skin from environmental stressors. Flaxseed's natural oils are known to help with oily skin and clogged pores. The fatty acids in flaxseed help to tone, tighten, firm and plump the skin back to a more youthful appearance. Lignans in flaxseed aid the skin. To add an extra boost to our Anti-Aging Serum, we added flaxseed extract. It works great with the other natural ingredients in this formula to bring back that healthy glow you may have thought you lost. If you regularly eat flaxseed in your diet, you may find that applying it topically as well will improve your results. 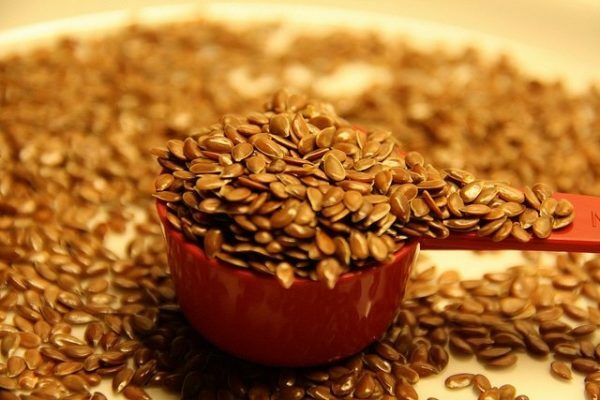 Have you used flaxseed in your skin care regimen? Please share your tips. Photo courtesy Yvonne E via Flickr.com. “Flaxseed,” University of Maryland Medical System, http://www.umm.edu/altmed/articles/flaxseed-000244.htm. Melissa J. Murphy, “The History and Health Benefits of Flaxseed,” Yahoo!, July 3, 2010, http://voices.yahoo.com/the-history-health-benefits-flaxseed-6284842.html?cat=5. As I couldn’t get flaxseed oil from market I cut some flaxseed oil capsules and mixed the oil with my anti wrinkle cream. Using this gave me excellent as well as encouraging results.